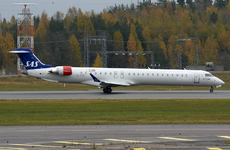 SAS flight SK4236, a CRJ-900LR operated by Cityjet, suffered a serious partial runway excursion on landing on runway 26 at Turku Airport, Finland. The aircraft operated on a flight from Stockholm-Arlanda Airport, Sweden. During the preflight briefing at Stockholm, the crew noted that a weather front was approaching Turku. They considered a VOR runway 08 approach, but given the low cloud base thought it unlikely that they would establish the required visual contact with the runway by the minimum descent height. They noted that runway 26 tailwind component was close to 10 kt, which is the maximum for the CRJ900. They selected Helsinki as the destination alternate aerodrome. The captain decided to uplift 500 kg more fuel than previously calculated, which brought the ramp fuel load to 4,500 kg. The crew was aware of the fact that the airplane would be close to the maximum weight for a landing at Turku. The first officer conducted an approach briefing and analyzed the anticipated threats, which included darkness, low cloud base, wet runway, and difficult wind conditions. The crew made an initial contact with Turku air traffic control (ATC) approximately 20 min before landing and received the latest information on runway and weather conditions. ATC reported friction as medium, deposits of 2 mm of slush over each third of the runway, and wind from 120° at 16 kt. The captain inquired ATC about runway 26 tailwind component, which was reported as 12 kt. The crew noted this was above the permitted maximum, but since the tailwind component was close to the limiting value they decided to continue runway 26 ILS approach and land, provided the tailwind component would be 10 kt or less. Should the tailwind exceed the maximum they would execute a missed approach and divert to Helsinki. They therefore requested ATC for an alternative missed approach clearance to 5,000 ft and also prepared to enter a hold. Approximately 8 min before landing, the captain studied the airplane’s performance calculations against the reported conditions. The captain calculated that the maximum performance limited landing weight for the prevailing conditions was 36,000 kg. The maximum structural landing weight of the CRJ900 is 34,065 kg. The crew members did not cross-check the calculations and continued the approach as planned. When the airplane was 500 ft above ground level (AGL), ATC reported wind from 120° at 14 kt and a tailwind component of 10 kt. The captain took control and stated they would land. The captain disengaged the autopilot at 121 ft AGL. The captain crossed the runway threshold at a higher-than-normal descent rate in order to aim the airplane at the correct touchdown point. The airplane crossed the threshold at 151 kt indicated airspeed. Touchdown occurred at a correct point within the aiming point markings at 151 kt groundspeed and 148 kt airspeed. Vertical acceleration at touchdown was 1.95 g. The captain selected full reverse thrust immediately after touchdown. At the same time the spoilers which are increasing aerodynamic braking and reducing the lift were activated. Due to a firm touchdown, weight on the landing gear lightened to such an extent that the airplane systems sensed an airborne condition. The design of the CRJ900’s full authority digital engine control system (FADEC) incorporates a logic that inhibits thrust reverser operation above idle power when the airplane is airborne. Consequently, reverse thrust was unavailable and FADEC commanded the engines to reverse idle. Although full reverse thrust remained selected until the airplane entered the skid, the engines remained at reverse idle. The captain initiated manual braking upon nosewheel touchdown. However, after touchdown, the wheels started hydroplaning and did not spin up to the normal rotational speed. A function in the anti-skid system, which is designed to prevent wheel locking during brake application, inhibited the system, and the wheels locked after 5 s from touchdown. The captain steered the airplane at first with the rudder and applied constant upwind, i.e., left aileron. 6 s after touchdown, the captain indicated an inability to control the airplane. The captain released the control wheel and attempted to regain control using nosewheel steering and the rudder. The captain also stated that a FADEC FAULT message had displayed; this resulted in reverse thrust remaining at idle. 13 s from touchdown, the first officer also initiated braking, assuming that the captain was not applying the brakes or the brakes were inoperative. The first officer did not notify the captain of the brake application. The rate of deceleration was low due to the lack of reverse thrust and the fact that the locked wheels were in a hydroplaning condition. Due to the loss of lateral grip, the airplane entered an uncontrolled left yaw 24 s after touchdown. The captain attempted to counter the yaw by applying right rudder until the rudder reached full right deflection. Approximately 30 s after touchdown, at 2024 h, the first officer transmitted a mayday call and a distress message on the ATC frequency, believing the airplane was skidding and was about to depart the runway. The message overlapped a taxi clearance that the controller was issuing. The first officer repeated mayday and the message 10 s later, and 48 s after touchdown told ATC that the airplane had stopped. 1. Aerodrome maintenance decided to clear the runway after an arriving flight had landed and a departing flight had taken off. The decision was not reviewed even though weather was changing rapidly and continuous snowfall increased the thickness of the slush layer on the runway. Conclusion: Long-term runway maintenance planning is not possible under rapidly changing weather conditions. 2. The flight crew did not question the weather and runway condition data on which they based their decisions. The flight crew monitored wind data closely. Conclusion: Some time had passed from the preparation of the previous SNOWTAM. Personnel at the aerodrome knew that snowfall was intensifying. SNOWTAM reliability degrades fast under rapidly changing weather conditions. 3. The airplane was above the maximum performance limited landing weight on landing. Conclusion: The multi-step procedure required to determine the permitted landing weight using the tables provided for the purpose contributed to an error in weight calculations. 4. At Turku, only runway 26 is ILS-equipped. Conclusion: The flight crew elected to conduct a tailwind landing on runway 26 because they considered a runway 08 approach impossible due to the lack of ILS. Finland's airports, with the exception of Helsinki-Vantaa, have ILS at one end of the runway only. 5. Landing was firm; therefore, weight on the right main landing gear lightened as the oleo leg extended after touchdown, the extension reaching a point where the airplane systems sensed an airborne condition. The thrust reverser system, although armed, was unavailable after touchdown. Conclusion: The flight crew was not familiar with reselecting the thrust reverser system in case of it being inhibited. 6. The airplane entered a hydroplaning condition at the moment of touchdown due to the high groundspeed and a slush deposit on the runway. Conclusion: Anticipating the possibility of hydroplaning enhances situational awareness and prepares for a necessary action if the airplane enters a hydroplaning condition. 7. Hydroplaning prevented the wheels from spinning up to a required speed and therefore the anti-skid system did not activate. The captain's brake application, which was later augmented by simultaneous brake application by the first officer, resulted in the wheels remaining locked until the airplane came to a halt. Conclusion: The flight crew did not recognize a hydroplaning condition and the fact that the wheels were not rotating. 8. The equation used to determine hydroplaning and hydroplaning speeds was verified in tests in the 1960s. The values derived from the equation do not necessarily correlate with modern aircraft tires, which may enter a hydroplaning condition at lower speeds. Conclusion: More knowledge, reports, and possibly research will be needed for the reliable determination of the hydroplaning speeds of modern aircraft tires. 9. Since aileron control was not applied throughout the landing roll, the airplane started to veer towards the right edge of the runway, pushed by the wind. Conclusion: In the CRJ900, the application of aileron control is important in order to maintain airplane control during a crosswind landing. 10. The verification of the prevailing runway conditions began approximately 25 min after the occurrence. Since the conditions were changing due to the snowfall, the runway conditions at the time of the occurrence were, perforce, based on estimates. Conclusion: It is essential for investigation purposes that the prevailing runway conditions are determined immediately after an occurrence. 11. The controller called the ERC, which alerted rescue units to respond to a minor aircraft accident. Paramedic units were not alerted, and the incident commander was not consulted about the matter.